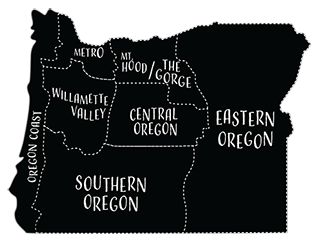 Through 1859 Explore, stay at the base of the Three Sisters Mountains for an ultimate Oregon getaway at FivePine Lodge. Voted Bend Living’s “Best place for Romance in Central Oregon”, its rooms provide privacy and serenity. From the Craftsman lodge to private cabins, they have created an experience that is anything but common. All hardwood furnishings at FivePine are hand built by Amish Craftsman in small barns and wood shops. Their Kohler Purist tubs are filled by waterfall. 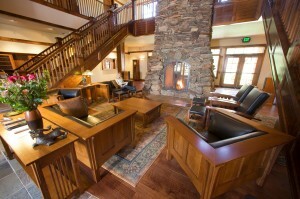 Each room is complimented with a fireplace, 42-inch Plasma screen and DVD player. From hand painted tile to hand carved chess sets, you will find it all in your private retreat. Guests receive a complimentary morning deluxe coffee and tea service, nightly wine reception, use of the outdoor pool and full access to the 16,000-square-foot Sisters Athletic Club. Take advantage of the campus wide wired and wireless internet. Most important is FivePine’s bed. You’ll enjoy a relaxing night’s sleep on the finest Simmons super pillow top mattress.